Total Encasement Locks for 2″ (TL-22) and 2-5/16″ (TL-23) Bulldog-style Couplers. Protects your unattended trailer with strong 5/8″ steel pin that extends to top of hitch ball hole. Heavy duty aircraft aluminum will not rust and push button lock recessed into heavy aluminium housing is tamper proof. Two keys are included. 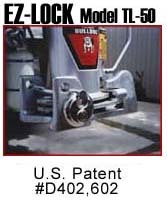 Model TL-20 fits all Hammerblow Bulldog style 1 7/8 inch, 2 inch, and 2 5/16 inch trailer couplers and similar styles. Place slanted side toward front of coupler (marked front on lock). Insert pin. Atttach your padlock. Model TL-38 fits 1 7/8″ and 2″ couplers. Simply slip the lock over the coupler and push the lock mechanism on the front to engage the 5/8″ steel pin. This secures the lock bracket onto coupler. Use the keys provided to unlock and remove coupler lock. Model TL-60 coupler lock for pintle drawbar eye is a deterrent against theft of trailers equipped with the drawbar for pintle couplers. Strong aluminum construction. Features heavy-duty 3/4″ steel pin to accomodate large padlock. Fits drawbar eyes sizes 2 1/2″ and 3″ inside diameter. 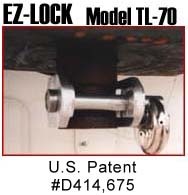 Model TL-70 King Pin coupler lock fits all King Pins for travel trailers and tractor trailers. Made from strong aluminum with heavy duty 3/4″ steel pin. Model TL-33 Now one lock fits more than 30 couplers. 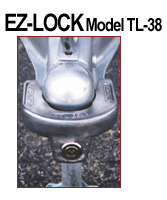 The EZ Lock Model T-33 Universal Coupler Lock is precision made of heavy grade aircraft aluminum and will not rust. It features a 3/4″ steel locking pin, for use with large heavy duty padlock Model TL-45(not included). Fits large 8,000 and 10,000 lb. 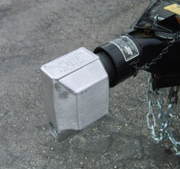 Atwood couplers used on many cargo style trailers. Model TL-50 is precision-made of aircraft aluminum and will not rust. It features a 3/4 inch heavy-duty steel locking pin. Fits Hammerblow, Stallion, Superior and T.E.M Gooseneck style couplers. To use , simply install the narrow end (looks like a goose’s neck) over the coupler bracket near the handle. Bring the wide opening of the TL-50 into position over the wide part of the coupler. Insert the pin into the hole that offers the tighter connection, then install your padlock. Model TL-51 For use with Model TL-50. Secures the adjustable toppart of coupler. Fits all gooseneck style round or square tube designs. 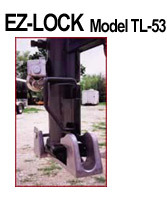 Model TL-53 Deluxe Gooseneck Combo. TL-53 consists of Model TL-50, Model TL-51 and two TL-45 large padlocks in one convenient package. Fast and efficient is how I would describe the team at Council Hitch. They have always taken care of our trucks.